The Missive Maven: One more for Halloween postcard? We need ONE more for the Halloween postcard... USA only swap, though more than one would certainly be welcome! Any takers? 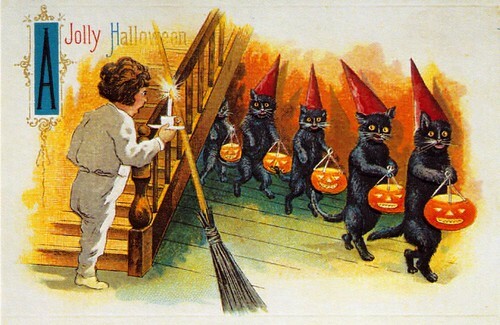 I am sending out several dozen halloween postcards, some vintage, some from overseas. Have already sent some, but no, none from zazzle, as I would rather send an opie or original 60 or 80 year old one. I would be happy to send out postcards if you let me know who to send to. I don't join swaps as I would rather send a postcard to someone because I want to without the expectation of return, or the limitation in creativity that can create. 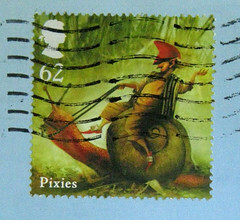 This was my experience with postcrossing. After 6,300 postcards sent out, I would rather send it than 'register it' - though I do take pictures of the postcards sent. Let me know, I would enjoying doing it. mpshiel, thanks for your interest. Swap-bot swaps have dates after which partners are assigned, and these swaps are now long since closed. But it's great that you love to send postcards with no expectation of return! Okay, sure. I just know that I post US delivery in the US on Sunday night for a Wed/Friday arrival, in time for all hallow and tonight and rest of weekend am working on halloween postcards so if you had some people to send to, adding five more to the 30-40 wouldn't be that difficult. But if that is all good, then have a great exchange. And if you know those who due to economic or physical/emotional limitations would like post but may not be able to reply, please send them to me, and I will get post into their mailslot/mailbox.